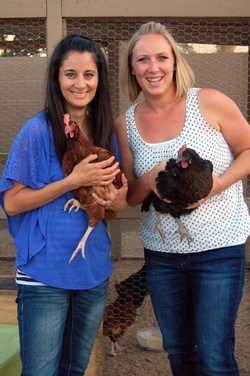 We bring this feed to Tucson for ourselves, our families, and our community. As two stay-at-home moms, we are committed to providing organic, GMO-free food to our families! The cost of organic feed can be a significant hindrance, so starting a Tucson co-op in which we could buy bulk feed was the only option to lower our costs and make it possible to provide this feed to our chickens. We also realized we can get much fresher feed as it is milled to order; you can literally smell the difference! It is, of course, true that you are what you eat. Studies show chickens' livers can’t filter the barrage of toxins found in most feed, so we just avoid the toxins in the first place. We were excited to find an affordable, organic, GMO-free feed which not only doesn't use unnatural growth hormones or harmful antibiotics, but one that doesn’t contain soy, corn, and/or grain by-products. Our aim is not to convince anyone of the value of this good, clean, 100% organic feed. We just want to bring it to our animals and help others who value GMO-free food to save money as they watch out for the health of their families.